Unlike many other countries, there is more than one romantic day on the Korean calendar, besides the traditional Valentines Day (Feb 14), there’s White Day (Mar 14), Black Day (April 14) and Pepero Day (Nov 11). Since there’s plenty of occasions for couples to show their love of each other, there are also many places around Seoul that cater to every sort of lovebird! So we’re revealing to you some of the best things to do at our favourite romantic hotspots in Seoul~! Defining itself as a ‘Romantic Urban Island’, Namsan Tower is not one of the biggest tourist attractions, but also the most frequented place for couples – and it’s not hard to see why! If you can survive the trek up Namsan Hill, you’ll discover a sea of locks, in all shapes and colours, hanging by the thousands from fences, rails, trees and heart sculptures located around the base and platforms of Namsan Tower. The tradition of love locks aren’t just for couples, they’re also for those who aren’t in romantic relationships, such as people who wish to send love to their friends or family members. Another great attraction Namsan Tower offers is it’s breathtaking, 360 degree views of Seoul city! Whether during the day or at night, looking at the city from that height, which may be daunting at first, always makes a superb romantic date. The Dongdaemun Design Plaza is famous for it’s various exhibitions, fashion shows, art and cultural events as well as international conferences – but those aren’t the only thing it’s known for. Surrounding the plaza, near the Yigansumun Exhibition Hall, is a garden of LED roses that light up as it gets dark! All 25,550 of these flowers were originally apart of a temporary exhibition in 2015 that celebrated the country’s 70 years of independence, but since it grew to be very popular with Korean’s and tourists alike, it became a permanent exhibition. And we’re so lucky that it did! The Dongdaemun Rose Garden offers beautifully unique views of both the flowers and the city, which makes it one of our favourite places to visit and is the reason why it has become an extremely popular destination for couples! Another one of our favourite ‘light’ attractions can be found at Everland (에버랜드), a resort that is open all year round with rides, a zoo and themed festivals! Past festivals that have been popular with young couples have been the Rose Festival, the Tulip Festival and, our personal favourite, the Romantic Illumination Festival. But even though these events aren’t available for the whole year, there are still plenty of other attractions for all sorts of couples! For those adventurous duo’s there are rides like the T-Express and the Dragon Coaster, for the more animal loving types there’s Everland’s Zootopia which is home to 2000 animals of 201 species and for the the quieter couples there’s Garden K, a botanical-themed restaurant that is famous for it’s bibimbap (비빔밥) and the therapy program they offer whilst you dine! Korea is known for having a variety of different themed cafes, but although some of our favourites include the cat and poop (yes, poop) themed ones, here are some of the best romantic cafes that are perfect for anyone celebrating with their loved one! 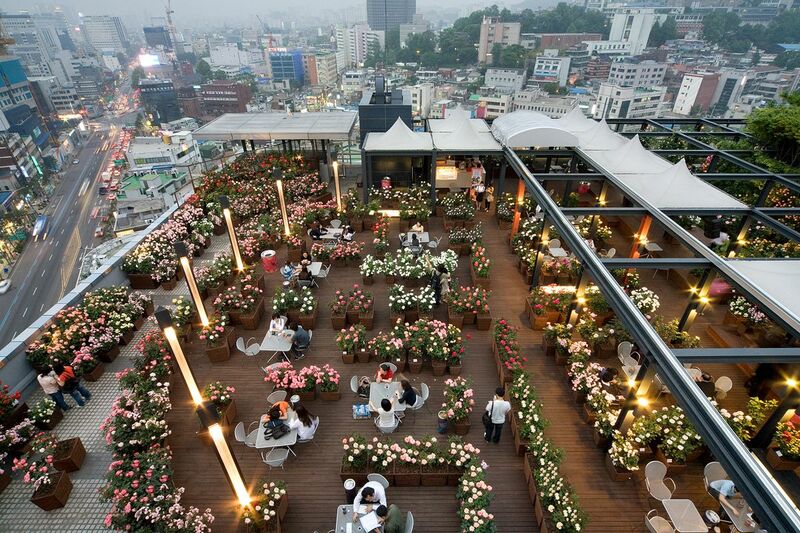 First up is the stunning Sky Rose Garden (하늘 로즈 가든), located on the 8th floor of the Daehan Cinema in Seoul, this cafe serves both great refreshments AND views as it surrounds it’s patrons with colourful flowers. Even though it’s nice during all times of the day, we recommend visiting during sunset in order to experience the best atmosphere! Another flowery themed cafe we love is the Blüte (German for ‘blossom’ or ‘flower’), which recreates the the feeling of the drama Summer Scents by having hundreds of yellow roses hanging from the ceiling! Our last cafe isn’t as ‘traditionally romantic’ as the other two, but trust us when we say that the Ring Making Cafe (반지만들기카페) in Myeong-dong is a must-go destination for any couple. Although it takes some effort to find, once you reach this cafe all you have to do is order your drinks, sit down and begin designing your ring! Not only is this cafe ideal for couples, it’s also a great place for friends, family and travellers who want to create wearable memories of friendship and love! Our last couple hotspot location is a simple, but elegant, one – a picnic in Han River Park! This is one of the cheaper and more convenient dates on our list, but that doesn’t mean it lacks on romantic value. Not only does the area around the Han River Park give stunning views of the city and river, it’s also home to many popular attractions, such as the Banpo Bridge Rainbow Fountain (반포대교 달빛무지개분수), Beodeul Square, Traditional Folk Madang (or dances), duck boats and bike rentals! Another reason why we love Han River Park is because everything is catered to you there, all over the park you’ll find mobile food and drink vendors, so you don’t have to worry about searching in vain for a meal. And in order to boost the romantic vibes we recommend going before sunset, that way you’ll be able to share the beautiful colours of dusk with the one you love! Best Art Museums In South Korea!